"First, neither the Gospels nor the book of Acts were "anonymous" in the first century. It can be reasonably assumed that the early churches knew-on the basis of personal relationships or oral tradition-the identity of the authors of these long books, which were foundational for the life and ministry of the churches. We may note the example of L. Flavius Arrianus of Nicomedia, who did not state his name in the preface of his description of the life of Alexander the Great, published in the first half of the second century AD under the title Anabasis; he explains this literary decision with the comment, "I need not write my name, for it is not at all unknown among men, nor my country nor my family." "Second, the anonymity of the historical books of the New Testament is a literary feature that distinguishes them from contemporary Greco-Roman historical books. It has been suggested that this is a specifically Christian phenomenon, which can be explained with the authors' conviction that Jesus Christ is the exclusive authority besides whom any human authority should remain silent. Others assume that the anonymity of the historical books of the New Testament emphasizes "the complete dependence of their authors on tradition, rather than on any firsthand experience." 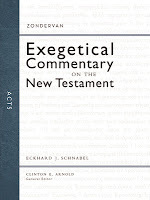 Eckhard Schnabel, Acts, Zondervan Exegetical Commentary on the New Testament, ed. Clinton E. Arnold (Grand Rapids: Zondervan, 2012), 23-24.